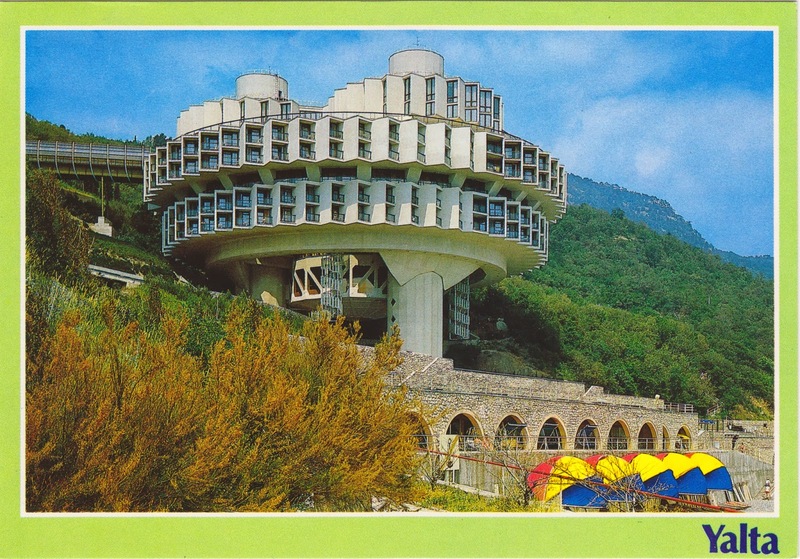 Postcard RU-1999185, arrived yesterday from Russia, was titled Yalta: The Students' Hostel "Druzhba". I had immediate suspicion that it was a little more than a hostel just from its appearance. With some research, it turns out to be one of the strangest buildings in the world. Druzhba is a Slavic word for friendship. 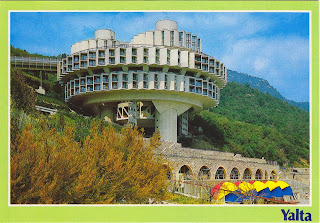 Druzhba Sanatorium (Friendship Spa), or Druzhba Holiday Center, was a joint venture between the Soviet Union and Czechoslovakia in the 1980s, overlooking a popular Black Sea beach 8 km from the then exclusive Soviet resort town of Yalta. The cylindrical shaped complex supported by giant cement legs, was built between 1983 to 1985 by Ukrainian architect Igor Vasilevsky and engineer Yurij Stefanchuk. It was space themed to commemorate the first cosmonaut Vladimír Remek from Czech on board the Soviet spacecraft Soyuz 28, launched on March 2, 1978, and the first Czechoslovak satellite Magion 1, launched as a Soviet scientific S/C hitchhiker on October 24, 1978. Not surprisingly as in the Cold War, its odd shaped, earthquake-resistant construction draw attentions from Turkey across the Black Sea as well as the United States, who suspected that the structure could be some sort of rocket launcher or missile silo. You can find out more from an article at Architectuul.com with a gallery of 14 photos and drawings. Sebastian Waack from Waack.org also wrote a fascinating story about it. For current availability and pricing, you can visit their reservation web site online.